This part of the program is under development currently and is changing daily almost. This topic reflects the state of the program at the time of writing and is intended to give an overview of the potential of the Earthquake Data Analyser. There is more to come that I have not shown here including stress "saw tooth" charts which one of the reasons for writing the whole QVSData program in the first place! It has been a long journey over three years but it is getting there now. 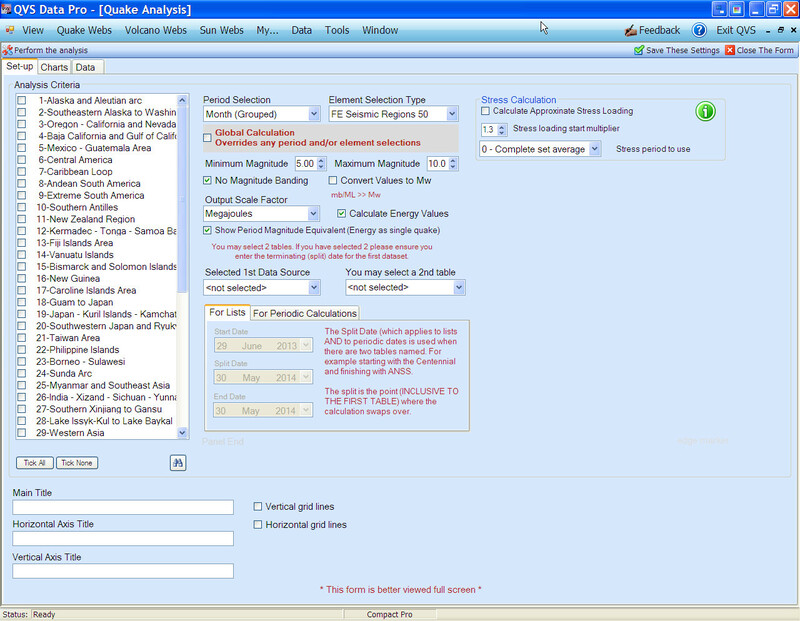 The data assembler is launched from the Data menu in main QVSData program. he opening screen of the tool looks like this (in the Pro version). How the screen first appears will depend also upon which settings you have saved. This tool deals with the analysis of earthquake data based on seismic regions. Currently the regions are the Flinn-Engdahl seismic regions – 50 in number – and on the Flinn-Engdahl geographic regions – 754 in number which are subregions of the main 50. Some of these subregions do not take account of geological features and QVS Data in conjunction with the Seabreeze blog are undertaking an exercise to re-appraise several areas to create a better seismic subregion. This is a current ongoing project and you can read details of the New Zealand area here. These subregions are also available in the analysis routine so you can compare old to new. Whilst the Pro versions come with the Centennial data imported (optional) already, the ANSS data has to be imported by you using the ANSS site and the tools available in the program. 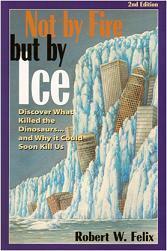 Again you should familiarise yourself with the availability and caveats of the data. Where you have elected to use two tables when the run crosses the end point the system will automatically switch to the next data table seamlessly. The last year (2002) of the Centennial is not fully complete so the systems switches at the end of 2001 if you are using Centennial data and you specify a cross-over date later than that. The first item, the List option, produces a list of earthquakes the system has found within the parameters. All the other options deal with grouping of the earthquakes and do not provide individual earthquake data. 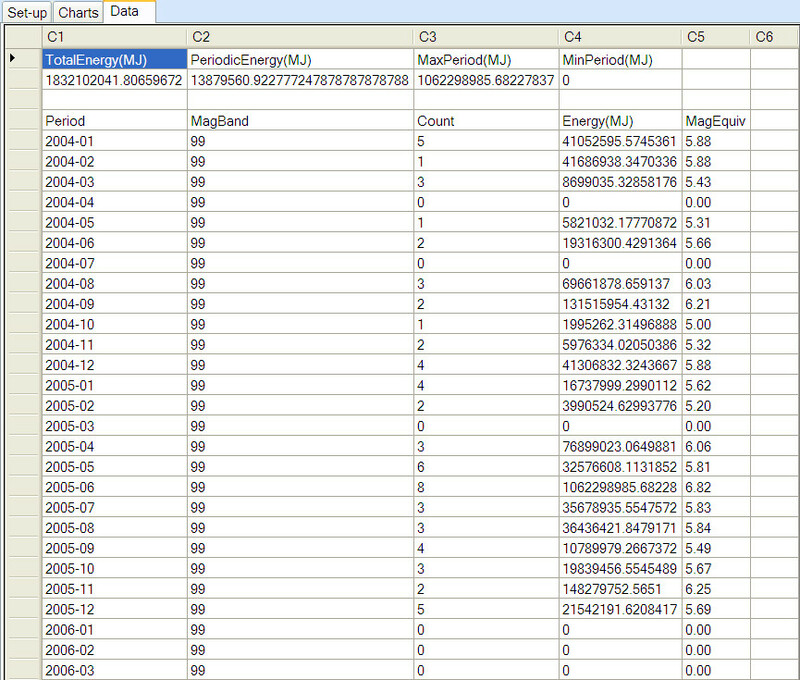 The sample output below, which you find on the data tab, was taken using a monthly grouped analysis for FE area 01 with no magnitude banding for magnitude 5+, with energy calculation and display of the single magnitude equivalent for each period. TotalEnergy, the sum of all the energy values in the file. PeriodicEnergy, the sum of the energy divided by the number of periods – an average in other words. MinPeriod, the minumum energy value of any period. If you want to copy this grid to MS Excel or any similar spreadsheet program either click on the top left square to select the whole grid, or select the area you wish to copy, and use Ctrl+C to copy the data to the clipboard. You can then paste to Excel. Of course if there are no values for any period the min value will be 0. 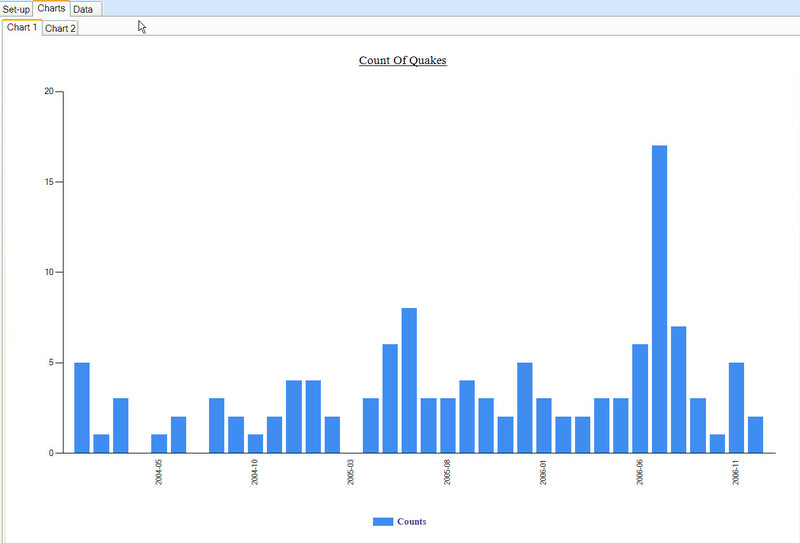 On the Charts Tab you will see a chart of the counts from the data. This is just a basic layout which I am sure you can improve on by taking the data into Excel. 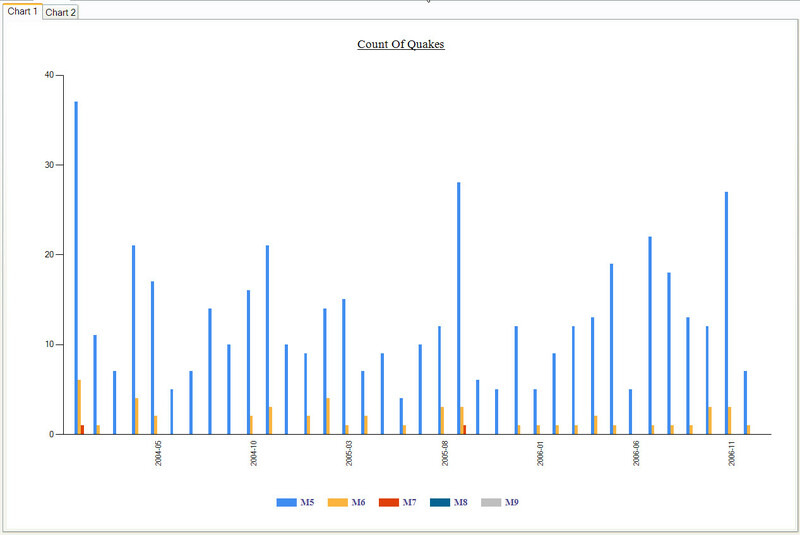 Coming shortly will be a chart of the energy values on the second tab in Charts. 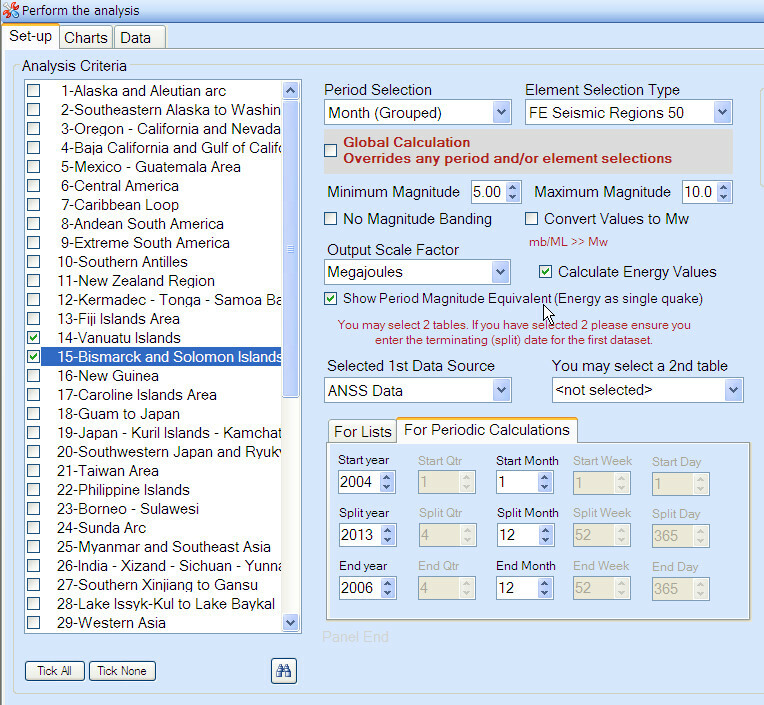 If the result is banded then each band will be shown with the count of earthquake numbers in each band for each period. Beside that is the energy value for each band for each period and then, if the magnitude equivalent is ticked the value of the energy converted back to a magnitude. A banded analysis should produce a chart with a column for each magnitude band. Tip: If you know there are no mag 9 quakes in the period make the maximum magnitude 8 to decrease the space used. There are a huge number of combinations possible and I am not going to go through them all but you should note that one of the benefits of the analysis routine is that it automatically creates holes for zero values. By this I mean that unlike a list which is contiguous even if there is weeks between the data, grouping creates a slot for each ‘period’. You can see the zero slots where there is no data. Sometimes, depending on the series, Excel can cope with a contiguous data set and will create spaces, but very often it does not. 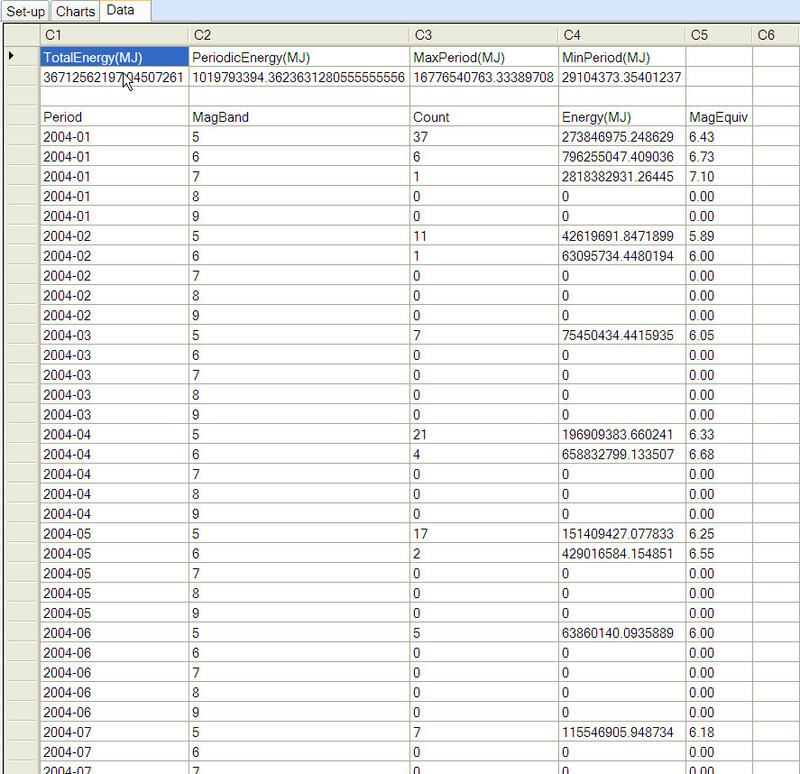 This method guarantees you get the correct spacing for the data. A note here about weeks and years. Obviously some years have 366 days and sometimes there are 53 (or 52 and a bit) weeks in the year. The system always starts the year on the 1st January irrespective of the day of the week, and a week is a 7 day period and may or may not be a calendar week. There are always 365 days in the year and 52 weeks in the year which means that the last day or two days in a leap year, depending on the period you are using, will end up being placed into the last day/week so it is possible that the last day could appear to have excess data. I consider this will have very little effect upon the data in realistic terms. I may revisit this later. Planned for the near future is the ability to convert to tonnes of TNT instead of joules. Small improvements may be made from time to time which are not reflected in the images in the help files immediately. Awesome tool. Would also like notification if it become avaliable. The tool is quite helpful. Where can I download it? Thanks! Hi, I am afraid that right at this moment the tool is still in development but it should not be too long. I will email you when the tool is available to download. Thanks a lot! I’m looking forward to it!